Hello, Low End Mac Community! My name is John Martorana. I'm delighted to have the opportunity to write for Low End Mac. In the coming months I hope to share with you my experiences and discoveries as a Mac user and tinkerer. Let me tell you a little about myself. I am 32 years old - born and raised in New Jersey, which is where I live now. My wife Jessica and I have been married for six years, and we have a son named Ben. For the past ten years, I have worked in the employee benefits and stock plan administration fields, primarily as a communications writer, presenter, and manager. My first experiences with Macs were during my freshman year of college at Rutgers University. The computer lab on my section of the campus was a small, glass-walled section of a place called "The Roost", a cavernous room in which many students met and talked - but I can't believe many studied. There were about 35-40 Mac SEs and Classics (and perhaps an SE/30 or two for the lab administrators) lined up on tables networked to 4 or 5 giant LaserWriter II printers that never seemed to stop printing. I wrote a number of papers on those terrific little machines. I had a Brother word processor in my dorm room, but I loved going to the lab to use one of the Macs. The college rebuilt The Roost during my sophomore year, and they reopened it with a lab about 10 times the size of the previous one - by this time the Centris 610 had replaced the compact Macs, and there were also IBM PCs and, later, X Window terminals. Around the same time, my parents bought my sister and me a custom-built PC, and a good friend bought a Performa 475. While the PC served us very well for years, my friend's 475 was always more appealing to me. It looked better, it did more, and it was just too cool. A few years later, while hunting around on this ingenious new website called eBay, I stumbled across an even better looking computer - a Performa 580CD. Just a year out of college, I made it my first big purchase. From the moment I took it out of the box, I was hooked on it and the Macintosh. So, what was it that hooked me? The Mac quickly reeled me in with three qualities largely absent in other computers or machines: style, comfort, and accessibility. More often than not Apple has been on the bleeding edge of style when it comes to the design and function of their computers. From the initial integration of graphics and sound back in the early days to the now passé (but nonetheless revolutionary) design of the compact Macs and their younger and brightly colored cousins, the iMacs, to the pacesetting design and functionality of most everything Steve Jobs has touched in his second-coming, Apple makes and markets computers with panache. They don't appeal to everyone, but they appeal to me. From the first time I sat down at a Mac SE in my college computer lab to write a paper, I have been struck by how comfortable Macs are to use. The interface, the integration of software and hardware, the design elements,and the ahead-of-their-time technologies all combine to create a machine that simply allows you to get stuff done with a minimum of stress or confusion. As I began delving into the history of the Mac and the various machines that have born that name over the years, I was struck by how accessible the technology was to the average tinkerer like me. Its accessibility rests on two pillars - one is the unique design of the Mac, and the second, and most important, is the community of Mac users that support these machines. Some call it a cult; I call it a community. Low End Mac is part of that community. The more I read, the more I learned from others like me, and the easier and more comfortable it became to tear apart a Mac and put it back together again, knowing that when I hit the power button, I'd hear that familiar Mac chime. It became great fun to find old Macs on eBay or from folks who didn't want them anymore and figure out how to get them running again. I've had many Macs, but right now I have two that I call my own. My very own "digital hub" is an iBook of the 2003 vintage - 900 MHz G3, 640 MB RAM, 40 GB hard drive, Combo drive, FireWire, USB, and all the rest. 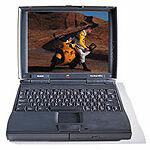 I also own a souped up PowerBook 1400c that I'll tell you more about in another column. The focus of my column will be the Macs I've tinkered with - the older Macs from the SE to the Quadra to the pre-G3 Power Macs. I'll tell you more about how I got started with Macs, why I like them, my view on the Mac vs. PC question, my wife's take on all of this, and what I've learned through tinkering with a long line of Macs of all stripes. You'll hear more about the first Mac I owned - the aforementioned Performa 580CD. You'll also hear about my beloved PowerBook 5300cs, my super-neat SuperMac C600, my diamond-in-the-rough PowerMac 4400, and my true-blue iMac DV (okay, so that last one isn't that old, but it is my favorite, so that has to count for something). You'll also hear about the wagonload of other Macs that have passed through my home (and that my wife has kidded me about) over the years - from at least two SE/30s that I can remember to a slew of the Mac II varieties and a stack of PowerBooks, most of which left in better shape than when they arrived. I look forward to sharing what I know and learning more from you as well. That Old Mac Magic articles copyright ©2005-06 by John Martorana. Low End Mac is an independent publication and has not been authorized, sponsored, or otherwise approved by Apple Inc. Opinions expressed are those of their authors and may not reflect the opinion of Cobweb Publishing. Advice is presented in good faith, but what works for one may not work for all.